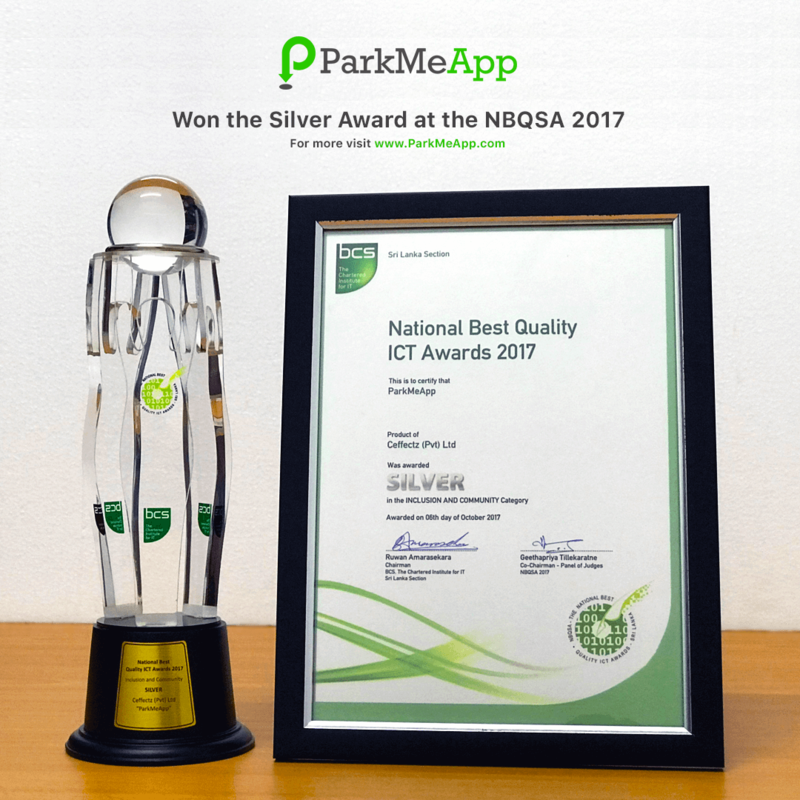 ParkMeApp is another successful innovation by Ceffectz (Pvt) Ltd, which have been awarded the Silver in the Inclusion and Community Category at the National Best Quality ICT Awards held on the 06th of October 2017 for the 19th consecutive time, at the Taj Samudra Hotel, Colombo. This is a proud moment for the Ceffectz family! Among many other awards presented to ParkMeApp, this is a momentous recognition that it received. National Best Quality ICT Awards (NBQSA) is the only National competition of its kind, which has been in Sri Lanka for 18 years awarding opportunities and recognition to outstanding individuals and organizations who have developed high quality ICT products. NBQSA is organized under 19 categories. Among which, ParkMeApp applied under the “Inclusion & Community” category. The core judging criteria of this category includes; Uniqueness, value to community & society, functionalities & features, Quality & Application of Technology and presentation. A total of 85 commercial category application entries competed in the NBQSA Sri Lanka 2017. This is a prodigious achievement by the ParkMeApp. ParkMeApp is a mobile application that provides parking solutions where this application is easily accessible to both Android and iOS users. ParkMeApp highly focuses on the usability and the user experience. They have worked their way through many hurdles to come up with the best UI/UX designs and the functionalities to provide a superior service to its customers. The ParkMeApp team have contributed immense effort in finding and adding the parking spots into this application. It is thanks to their force that the parking spots in this app are perfectly accurate and reliable. Currently, ParkMeApp includes of 5500+ parking spots and growing. Now, ParkMeApp team is taking this technology another step forward! We are currently working on implementing real-time parking availability tracking devices with the IoT technology. We can proudly say that we are really happy with our progress as we have managed to realize this in less than 10 short months. ParkMeApp is an enormous relief upon the daily annoyance with the parking issues. This is an essential piece of service to our current modern and evolving Sri Lankan market. ParkMeApp comprises of many useful features. Finding nearby locations, searching for parking spots, navigation to parking spots, reservation and advanced filtrations are just some of the features that it offers. ParkMeApp in its unique and perfectly executed design, provides an inspiration for many innovators. It has justly earned the true worth of the awards that it has been presented with.